According to a patient survey, living a normal life and taking time off is what patients miss most. For patients, however, travelling seems to be full of obstacles: logistics, administration and of course the fear of the unknown, i.e. how will people take care of me in another centre, in another city, in another country? 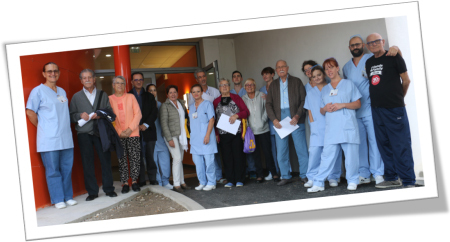 The chance to enjoy the beautiful nature of Camargue in France turned to reality for a group of Spanish patients who were welcomed to the recently opened centre in Arles. The group’s travel was organised by ADER, the Spanish Renal Patient Association. “At Diaverum we know that travelling is a large step for patients. It is about establishing trust and feeling at ease, even more if treatment is performed abroad,” says Charles-Alexandre Thevenin, France HR Director and country coordinator for Holiday Dialysis. “Being aware of this, the whole medical team of Diaverum Arles did everything possible to give the patients a warm welcome at the centre,” he adds. Doctors, nurses and carers volunteered to extend their shift hours to personally welcome each Holiday patient to Arles. “The Spanish group highly appreciated this priceless and personal gesture. This is what makes Diaverum special. Thank you, Merci and Gracias to the whole team of Diaverum Arles, especially to Head Nurse Yolanda Gamarra, for making this happen,” he says.